White collar crimes are typically non-violent, financial crimes committed by professionals or business people. Examples include securities fraud, embezzlement, money laundering, and tax evasion. Both state and federal statutes govern white collar crime, and both individuals and corporations can be named as defendants in white collar crime cases. If you are charged with a white collar crime in Oregon or Washington, it’s imperative to obtain the legal counsel and representation you need promptly. Call Portland white collar crimes lawyer David T. McDonald. With 25 years of criminal defense experience, Portland white collar crimes lawyer David McDonald is ready to represent you. White collar fraud is basically deception; it may include concealment, misrepresentation, and reckless disregard of the truth, with or without an intention to deceive someone. Fraud is also a tort crime that can lead to both civil and criminal liabilities. Common forms of fraud include mail fraud, wire fraud, and bank fraud. In today’s tough economic climate, mortgage fraud, healthcare fraud and identity theft are also increasing. Those accused of white collar crimes in Portland typically don’t have a prior criminal record, although many are experiencing financial difficulties or other stressful personal circumstances. In a white collar crime case, an experienced Portland white collar crimes lawyer works initially to have your charge reduced or dismissed; sometimes, criminal charges can be dismissed based upon an agreement with the complaining party in a process known as civil compromise. 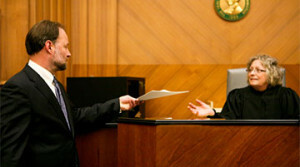 In other cases, the best result is a reduced sentence in return for restitution or completion of a treatment program. Portland white collar crimes lawyer David McDonald always pursues alternatives to incarceration including community service, work release, or electronic home confinement. The key to any criminal defense is to act as early as possible to find the weaknesses and strengths of a case and to take control of it from the beginning. If you are facing any white collar crime charge, contact Portland white collar crimes lawyer David McDonald today. In Oregon, David McDonald represents clients in Portland and in Washington, Clackamas, and Multnomah counties. In Washington, he represents clients in Clark County and throughout the state’s southwest region. He also works with Spanish-speaking investigators and interpreters to represent clients in the Hispanic community. To learn more or to arrange an initial telephone consultation, call the law firm of David T. McDonald at 503-226-0188 or complete the form on our contact page. Evening and weekend appointments are available. © 2016 by David T. McDonald, P.C. All rights reserved. David T. McDonald, P.C. 5 out of 5 based on 1 rating.